It was another beautiful day in Asmara, with a few clouds and hope of a reddish yellow sunset. The villa where I had spent the night was big and had a green door. Since the last three days I had known that I was trapped. The Ethiopians were there outside going back and forth in their white car. They had been following me at work, at home, and on the road as I contemplated what was going to happen. Just this once, I had decided to go to a cousin and thus the villa with the green door and a well kept garden. I saw the white Lada pass by again in the evening. At the time in Asmara, only Ethiopian security services had this car. The soldiers had a saying in Amharic, "Volvo le Derg abal, Lada laQaTari, lenie bcha yeQeregn ye nat ager Tri" (Volvo for the military, and Lada for then security) as they were forcibly recruited to go North. These and many thoughts, my life, fear, "is this real?" kept me busy the whole night. The knock came early morning. I heard them asking for me and went out to meet them. They were three well dressed young men between the ages of 25 to 30. That meant jeans and "pano" trousers. I looked at my cousin and told her not to worry. I would tell them the truth that she just was a relative and that I came to her house often. They seemed to know this and never asked me in detail. I was grateful that nothing happened to this cousin. They put me in the back with one of them and drove until we reached my home. There they searched the apartment for incriminating evidence as they called it, i.e. Eritrean pamphlets. They did not find any. There were some Eritrean newspapers but well hidden in an old cupboard. When they could not find any, one of them said "this one is smart; she will only talk upon torture". We then drove to the prison in the market, the “Karchelie" an old prison built by the Italians. One entered the big archway, registered at the side door, through the courtyard and then into a series of lined small doors with metal windows. I stayed in one for three days without anyone asking me anything. There were four other women with me. Each had a different story. I remember one was there found with a group going to the Sudan. Another was a very tough looking girl charged with a brawl. We were all interested in her story. I had never heard such a thing. The third day in the evening I was called and again with another Lada, I was transferred to "Mariam Gembi". This did not bode well as it meant my case was serious. This was a transfer to the prison for political reasons and the one in the market was for „regular “crime. The girl arrested for trying to go to the Sudan followed me after a couple of days. We met again in Columbus Ohio, but that is a different story. Since Mariam Gembi was a building two blocks from my home, I always wanted to correct everyone who ever said ”Mariam Gembi" to me. Yes, our brains do not stop working just because you were in car with security men who were going to beat you up soon enough. I kept thinking of all the stories one heard about this awful place. The building used to be a clinic run by nuns and named after Holy Mary for the month of May i.e. Genbot in Tigrinya. There was a gate with a half moon archway with a writing that was phonetic geez (Tigrinya) Mariam Genbot. In the ensuing years the’t’ had fallen off and so the 'b' was left making it a 'b' to read "Gemb". I always wanted to tell people, it is Mariam Genbot, not Mariam “Gembi”. At this time it had been taken by the government. I heard from the rumour mill that the former owner had been one of its first occupants as a prisoner. By the time we arrived the offices were closed for the day; they took my name and put me in a small room with other women. The next day I was again moved to another big hall with more than 40 to 70 women. At one point, a group of village women came in and when they saw all of us, started crying, “ewaye deQeye, ewaye deQeye” (Oh my children, oh my children). They sure did not see what is happening now coming. They were let go with a warning not to give Injera (local bread) to rebels. Each morning started with a policeman calling names and then accompanying him (they were all men) to the rooms where the investigators (in plain clothes) would write down their statements. The next day, I was called around 8 am and I told my side of the story. This had started at my place of work. A young woman came in stating that she was looking for work. I told her she had to go through the Labour Office as we were a government run enterprise. She came back a few times chatting normally. Then one day she sat down and gave me a letter handwritten in a plain squared paper used in Arithmetic classes. It asked for my "help" and had the stamp of the ELF. I was shocked because she had never talked politics with me before. I had begun to notice strange faces around the office and she had an Ethiopian accent, i.e. Tigrean*. After thinking I came to a decision. I took the paper and made a copy while pretending to get tea. I then returned it to her and told her that I would not help. I had a family to take care of and would not involve myself with politics. She did not say anything but went out. I called a friend and showed him the copy of the letter. He looked at it, made inquiries, and then a couple of days later told me that this was neither the ELF nor the EPLF. This left the Ethiopians. They came to pick me up a few days later as I was making plans with this friend to get out of the city. Back to "Mariam Gembi" and the second day of questioning by a security officer in which I again said the same thing. It was then that they showed me what my visitor had written with her name, Azieb Zeweldi, on a signed statement saying that I had talked to her about helping the Eritreans. That I had made a suggestion that “sale from the fruit could be given to the rebels and that I would arrange it.” I was working at the Elabered Horticultural Factory office at the time as a secretary and had no access to financial dealings. It was also a lie. I had never discussed anything like that with her. I had told her that I would not help her in any way. The officers seem to think that when I saw her statement, I would agree with it. Since this had not happened, I could only state that it was not true. She had also given me a different name. Two of them took me to a part of the building that used to be a 'mogogo' (a separate room for making injera). There they made me put my hands, tied, under my feet and inserted a wooden pole through my legs. They hoisted me up and put me upside down making my bare feet 'at arm’s length. The investigator started looking for a stick. One of them took what I think was a hard stick with plastic rope around it and asked if I had anything more to say. “No”. Then he started beating the soles of my feet. I started to scream but they put a piece of cloth on my mouth. I started to choke. Later I found out that I always had what is called a 'quick gag reflex' (I choke or vomit if I smell heavy perfume, bad smell or travelled in cars through winding roads). I soon started to choke. They took the cloth out. They gave me the option of 'keeping quiet' without the cloth. The one beating me then started again but I quickly lost consciousness. I came to after they had untied me and was on the ground. They both held me up. The 'main' investigator then said if I change my mind, they would be there to listen. I could even ask the guards to call them. My mind was not ready to reply or to talk. I was wobbling and could not walk straight and my feet felt big. When I entered back into the prison hall, I stumbled and the other prisoners helped me to get to my place. One of them looked at my soles and started massaging my legs. I was in so much pain I could feel it in my head. Until then I had not noticed the prisoner next to me. She was a small woman with big eyes and a sad face. She looked at my feet and then told me not to lie down. She started to ask me details and then told me about her experience. The next day, my name was called first. Again, I was taken to the room asked if I had changed my mind, and when I said 'no' that is what happened, again we went to the 'torture chamber'. This time I was put face down on the floor, my feet and hands were tied behind me, and then pulled together to form what was called a ‘boat’. This also made the feet 'convenient' for beating. After being on my feet for awhile, I lost consciousness more quickly than the day before. This time it was worse as the soles were already tender. They untied me while saying "this one will die in our hands" (beEjachn tmotalech). I fell down and they had to help me walk back. Both continued saying 'This is our job but we do have feelings,', 'you know we have sisters too' and 'why don't you just tell us' were the words I heard. They then handed me back to the other prisoners who were waiting for me at the door. When these saw the soles of my feet, they again started massaging my calves (they did not touch the soles as they were quite bruised) and making me walk around and around while I felt like lying down. This was so that the soles would not break and the skin remains intact which made healing easier. I realized this later. Then, I only wanted to shout at them to stop making me walk. This time my neighbor said 'after her ordeal, this was the worst case of feet beating' she had seen. Then she showed me her own feet with soles or what was left. Her soles had healed to fine flesh. There was no fat left and she walked leaning sideways. From that day on, she talked to me and gave ne encouraging words. She told me how a relative had wanted to marry her and when she declined, told Ethiopian officers that she was a supporter of Eritrean independence and made up a story. As he was a deserter from the Eritrean side, his accusation was deemed trustworthy. Her questioning under torture went on for more days than mine. The pain was intense. The other prisoners and my neighbor would not let me lie down. They made me walk around and around on gravel to make the soles tougher. My feet were black brown and my nails were all black. At night I would lie awake looking above for moonlight sneaking from the tin roof. During these two days, someone overheard the guards talking about an escaped prisoner. He had been accompanied by two investigators and was told to sit down outside the offices while they registered him. He was a well dressed young man and was said to have been quiet. They entered the room where the officer in charge was, and in the meantime, this prisoner stood up, slowly sauntered off to the door, upon the pavement that divided up the small garden into two, facing the door, and just went out, turned left and disappeared. From that day on, all prisoners were accompanied and the men had to have their belts and shoes off. The total loss of control was foremost daily. Your life did not belong to you. Someone who happened to be on the side that was hired to go against the place where you were born was now in charge. He (no women investigators) took orders, implemented them, and had your persona in his care. On the third day, at night, the hall suddenly opened and one of the men interrogating me came in accompanied by the regular police guards. The door was metal and it clanged loudly. Everyone sat up in fear. They always came in the mornings and late afternoons, to count us and never at night. We were all lined up on the walls where each of us had a place where we can sleep straight. Those along the walls had the “best” places while the new ones lined up in the middle of the room. The interrogator jumped over the huddled prisoners (as I was on the far wall near a corner) and came straight to me. He pointed at me and said 'Are you still sticking to your story', and I said 'yes'. He looked around and then walked out again with the door banging. As soon as he was gone, all eyes were on me. I was finished. This was it. I hoped it would be over soon. I really could not have changed my story even if I had wanted to. It was what it was. The main investigators were Ethiopian soldiers while the guards, cleaners, and a gardener, were Eritrean. This did not make any difference to the prisoners. No one could afford to be 'nice' as each was watching the other. And one could not believe the prisoners either as there were some prisoners who were in the pay of those in charge. There were women who were there for having paid 0.50 cent each per month from their factory wages. The person who collected the money had 'talked' and gave the list when arrested. Some were suspected members of the underground cells. Most were not. The Ethiopians, at this time, seemed to be rounding up anyone whom anyone else has (picked on or pointed at I forgot the English word for this). My story and the story of my neighbor were similar. We both knew much what was happening but both were caught up in the daily rounding up of suspected people innocent of the charges put to us. Everyone in Eritrea at this time knew someone or something. But when they catch you for something you have not done, it is a big punch in the stomach. After the investigator had left, I thought I would not sleep. But I did. The next day nothing happened. I was not called at all for a week. Every day I would stand up when the policeman came to call names. A week passed and beautiful days came and went. Another five weeks passed. We were let out once a day around 4 in the afternoon and the metal door was kept open for air. Otherwise, the stink would be terrible. One day, the policeman came again in the morning. As usual, we all looked up and waited. He called my name. I did not move. He called my name again. The women were looking at me now. I put my shawl about my shoulders and walked over to him. As I reached him, he said, 'go back and get your things, you are leaving.' A hand with pointed nails was clutching my chest. 'And where am I going?' I asked him. He was a policeman who was not unkind. He said, 'You are going home, your people are here. Hurry.'. I went back and I think I said something to the women near me. That it was alright, that I would come back with something. It always happened. When one is released, she is asked to bring back something food, clothes etc. A few clouds decorated the sky and a cool wind blew in the shade as I walked from the prison hall to the offices for processing. My clothes were in a plastic bag. I walked into the offices and saw my mother and one of my uncles. 'You are out on bail' my mother said, 'He is putting it.' I said alright. The investigator was one I had never met but definitely the man in charge. He started writing down my information and then told me to be careful next time when some rebel asked for my help or if someone wanted me to go out of the country. I said I would be more careful and walked out of this prison back to my neighbourhood and in front of my kindergarten and into my neighbourhood. As I walked the pavement that I had grown up on, I felt like I was floating. I was not supposed to be here. I was supposed not to get out. That was the only way to survive, because if I had hoped for life, I could not have made the days go by. As I looked at the houses and the shops and the windows, they did not look real. I stepped into the pain on my feet. With each step, the pain went to my head. I pondered and thought of nothing. I was numb with the surprise of life. I had no time to heal. I went back to work immediately. My feet were still brown and black. I slowly realised that my left side was feeling funny. My left hand would suddenly stop at mid air. I could not sleep on my left side. It took almost two years before this healed and I kept sleeping on my right side for many years. I had always said I would not leave but this time I was certain and it had to be before they came for me again. I kept my promise to the prisoners. I went back and brought them things. As to my neighbor, I did not want to get her into more in trouble by following up on her case. One never knew. I heard later that she was released on a blanket 'amnesty' and 'understandings' made by a new person in charge of Eritrea and the prison system, Dawit Woldeghiorghis. This was to be a new phase into the way the Ethiopians at the time handled the “Eritrean problem”. Before this time, everyone was a suspect and “guilty before found innocent”. They now began a system of having people call in anonymously with tips, those who were pulled in were able to face their accusers, more people were let go in complete contrast to previous years where anyone blamed faced torture, and disappearances. Those who were jailed had a chance to get to court and get advocates. Twenty years later I was back in Asmara and was walking in the rain when I bumped into my friend, the prisoner on my right, as I used to call her. I had already assumed that she had left the country like most prisoners. I looked and could not believe my eyes. I called her name and when she saw me, she recognised me too. We chatted. She had never left. Later I wrote a poem in Tigrinya titled 'to a fellow prisoner friend' easier in Tigrinya 'nmeteAstri' mainly showing gratitude that she was alive and is able to bear witness to what happened then. I also visited Mariam Gembi and was surprised at doors, a secret cellar later rebuilt or I never was taken to and stairs which I did not know about while I stayed there. The signs on the walls and the doors were still there. To me this meant the faces of prisoners who were there before and also when I was there. I kept remembering their faces when I left that beautiful day in Asmara. This was a different time and different context in the Eritrean history with Ethiopians in charge. Maybe we should name what is happening now Blue Terror. For those who may remember these days in Asmara, this happened in the years following the starting of an official „Red Terror “against „White Terror “by the Dergue. In Eritrea, this was led by the infamous cadre, Tsegalul. It was said that he had already perpetuated “Red Terror “in Tigray. The rumor was that he was so successful, he was sent to Eritrea to „pacify” the province using the same method. One of his first attempts was to start public dialogues before rounding up Eritreans. I only remember hearing about the one in The Capitol as an example. Here a teacher named Zerai (I do not remember his father’s name) asked questions. Sometime later Zerai was picked up by the security, and a few weeks later, he and about 10 teachers, one of them a woman, were executed with the news was sent over the radio. The „goat song “(yefiel wetete) was sung during the announcement. Ever since the Dergue came to power, whenever an execution was announced, this song was the sign that someone has died. This was the time when the Ethiopians were using many citizens from Tigray and also Eritrean born in their security system. Because they spoke the same language, they could make friends with Eritreans, understood the relationships, and knew the cities and countryside very well. Such attempts to control the Eritrean situation only helped to increase the perception that Tigreans were with Ethiopians and fuelled mistrust and misunderstanding. This attitude conveniently forgets the Eritreans who were doing the same thing. It is with this background that the present regime feels it could use these in their assault against any opposition while giving help to those from the same source. Ironically at the time that this story was taking place, the TPLF, (Tigray People’s Liberation Front) with the help of the EPLF (Eritrean People’s Liberation Front) was making headway in the rebellion against the Military Regime in Ethiopia. The TPLF also helped the EPLF gain momentum. Their history is now being told by veterans on both sides. Enda Afras - prison in Asmara/Eritrea. this use to be the stables of the ethiopian emperor. 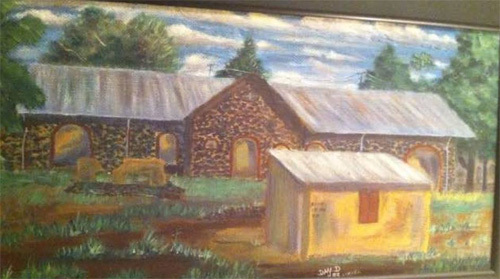 The small room with one window was later turned to be the torture room by the ethiopian regime called dergue. Berhane went through this torture room. Fikrey Birhin Save it preciously Aida Kidane. Make copies so not to lose it or time might destroy it...it is our history as painful as it is. EGDEF prisons will be preserved and/or re-built for history. We need to unite and think about the Eritreans that screamed in so many torture rooms. To the left of this painting there is the only small water faucet prisoners used to help each other to wash or drink. The black stone building at the back is the prison itself..it was called "adarash" Mariam Ghimbi came after 1980...Enda Afras was the notorious prison room that can compare (in regard to Eritreans) to the 3gna Police Tabia (3rd district police) in Addis Abeba...where Shaleka Tafera would collect Eritreans in Addis Abeba EACH DAY & NIGHT (! )...put them in a truck, drive them to 3gna for torture and then take them out to a firing squad...Imagine that the latter's mistress was Eritrean and each time he came back home, she polished his boot splashed with blood and washed his clothing....it is hell only to imagine the betrayal. And now, some Veterans still keep talking (to this day ) about their "meda" time and refuse to unite....we need to ignore them Aida. You are a very important person that will be called to re-build Eritrea with your knowledge and your archives. I personally thank you. Aida Kidane That horrible place many innocent were tortured. I saw it 1991 with names written on the walls.